I have decided to go with just the 4 balls as the bowl just didn’t help the composition, I’m going to use watercolours for my final painting as I think it really suits the subject. I can’t believe it is coming to the end of term already! I have decided to use one of the project titles given to us, Blue & White China. I have 4 balls and a bowl that I keep them in, I call it my “Therapy Bowl”. My counsellor came up with the idea to help me visualise all the good things in my life and they give me a tangible thing that I can hold onto when my depression kicks in. I also keep a tissue in it, that I can shred and throw away whenever something irritates me or annoys me, it really does help me rid myself from those emotions. I have decided to start off with some thumbnail sketches of various compositions to determine which one I am going to use for the final painting. Once I am happy with the composition I am going to do the painting in watercolour. This entry was posted in Sketches, Still Life on December 7, 2012 by Lea Sapsford. I finally finished a sketch today of a Fatsia Japonica Leaf. I borrowed a friend’s magazine and I found this brown leaf that was curly and I just had to draw it. I’ve posted it under the Sketches tab. This entry was posted in Graphite, Sketches, Still Life on June 11, 2012 by Lea Sapsford. I finally finished my hand sketch today and I also completed another sketch of my hand holding a glass. I have posted them both under the Sketches Tab. This entry was posted in Graphite, Hands, Sketches on May 15, 2012 by Lea Sapsford. Hands are difficult to draw so, in today’s lesson we concentrated on finding the best ways to go about drawing them. We started off drawing around our own hands and then filling in the detail and tones. As you can see I haven’t finished mine yet so, I’ll finish it at home later. We were also going to try different poses. Only a couple of people managed to do 2 different sketches. I’m going to do some different poses. It was also suggested that we get a mirror and draw our hand’s reflection and a final challenge is to draw our hand holding a clear glass. I’m keen to try that too, so, once they are completed I will post them. The next 3 weeks of term will be for project work. I have chosen to do a cottage door with flowers around the door frame. This incorporates 2 of the project titles Architecture and Foliage. I’m really looking forward to starting it. 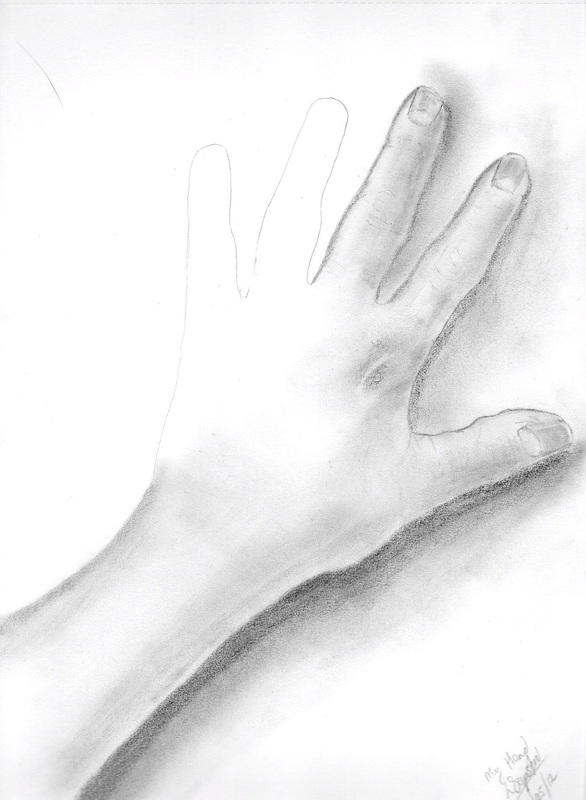 This entry was posted in Graphite, Hands, Sketches on May 11, 2012 by Lea Sapsford.